Girija Prasad Koirala is one of the top leader among many political leader, he was born in 1924, in Saharsa, Bihar,�British India. His father name was Krishna Prasad koirala. He was�commonly known as�G.P. Koirala. He headed the�Nepali Congress�and served as the�Prime Minister of Nepal on four occasions, including from 1991 to 1994, 1998 to 1999, 2000 to 2001, and from 2006 to 2008. He was the�Acting Head of State of Nepal�between January 2007 and July 2008 as the country transitioned from a monarchy to a republic. Koirala, who was active in politics for over sixty years, was a pioneer of the Nepalese labour movement, having started the first political workers’ movement on Nepalese soil, known as the�Biratnagar jute mill strike�in his hometown,�Biratnagar. In 1991 he became the first democratically elected Prime Minister since 1959. He was one of the best and helpull political leader he was always helpful, kind and polite with every one due to which he was very much popular after his death too. No one can be better leader than him. Madhav kumar Nepal is also one the leader and ex primeminister of Nepal. He was born on march 6,1953 in gaur, rautahat, Nepal.He was primeminister since 25 May 2009�– 6 February 2011. He joined the�communist �movement in 1969. In the underground struggle, he used party names such as ‘Subodh’, ‘Sunil’, ‘Ranjan’ and ‘Bibek’. In 1971 he became a district committee member of the�Nepal Revolutionary Organisation (Marxist-Leninist). At a conference held in�Biratnagar�June 7–8, 1975, M.K. Nepal was elected as a bureau member of the�All Nepal Communist Revolutionary Coordination Committee (Marxist-Leninist). When the ANCRCC(ML) founded the�Communist Party of Nepal (Marxist-Leninis)�in 1978. He was elected a�politburo�member of the new party. He was the Deputy Prime Minister in the Nepalese government during the CPN(UML) minority government in 1994-1995 as well as the leader of the opposition in the�National Assembly�during the 1990s.He is also one of the good leader who contribute a lot of things to his citizens. Gagan Thapa is the current health minister of Nepal. He is a member of Central Working Committee of the�Nepali Congress. He is one of the most popular political leaders in Nepal and has a large following in various social networking sites. He emerged as potential future leader of the country during the agitation against�King Gyanendra’s direct rule during the months leading to the�2006 democracy movement in Nepal. Since then, he has been seen as a fresh and young face in contrast to the usual political landscape dominated by septuagenarian and octogenarian politicians who have been in the political center-stage for decades. The young generation often portrays him to be their leader as a future Prime Minister of Nepal.�He was also a member of�1st Nepalese Constituent Assembly�(2008–12). Widely recognized for his oratory, many Nepali people believe that he can lead the nation in an executive role if presented with an opportunity. He is one of the best political leader who have done different good works for the welfare of the citizens. He has bring a lot of changes in the health sector due to his good deeds he is very popular among all the citizens or we can say he has become the twinning star of everyone’s eyes. Puspa Kamal Dahal or we can say prachanda is the current prime ministers of Nepal. He is one of the �is a Nepalese politician and the chairman of the Communist party of Nepal (maiost). Dahal led the CPN (M) as it launched a communist insurgency on 13 February 1996. In the ensuing�civil war, more than 17,000 Nepalese died. Ultimately elections were held in 2008 and the CPN (M) emerged as the strongest party. The�Constituent Assembly of Nepal�elected Dahal as Prime Minister in August 2008.�He resigned as Prime Minister on 4 May 2009 after his attempt to sack the army chief, General�Rookmangud �Katawal, was opposed by President�Ram Baran Yadav. He had� been been prime minister in 2008 up to 2009. He is one of the famous� political leader of Nepal Now days. Bidhya Devi Bhandari� is theSecond and current president of Nepal. She is first lady President of Nepal.She was elected in 2015. She is the�first woman to hold the office.�She was the vice-chairperson�of the�Communist Party of Nepal (Unified Marxist–Leninist)and chair of the All Nepal Women Association before winning the presidential election on 28 October 2015.She was elected as President in a parliamentary vote, receiving 327 votes out of 549 and defeating�Kul Bahadur Gurung. In 2016,�Forbes�placed her 52 in their�list of the world’s 100 most powerful women.�She previously served as the�Minister of Defence of the�government of Nepal�and was the first woman in�Nepal�to hold that post.She was also the minister for Environment and population in 1990s. She is one of the good political leaders of Nepal. Kp oli , his full name is khadga Prasad Oli, he is the ex primeminister of Nepal. He started� his political career in 1966. He joined the Communist Party of Nepal in February 1970. He became involved in subversive politics in opposition to the party-less�Panchayat System in place at the time. For his activities, he was arrested for the first time in 1970. A year later he became the District committee member of the party and soon the Chief of the�Jhapa Movement�Organizing Committee in 1972. �He then went on to hold the post of chief of the foreign department of the CPN (UML) in 1992. Oli also became the Founder President of the�National democratic youth federation�(DNYF).He was elected as a member of parliament in the House of Representatives from Jhapa district electorate no. 6 in 1991He was elected as Prime Minister in a parliamentary vote on 11 October 2015, receiving 338 votes out of 597. Oli’s PM candidacy was supported by the�UCPN-Maoists,�Rastriya Prajatantra Party Nepal, and Madhesi Rights Forum-Democratic along with 13 other small parties. He �has contribute a lot of good things for the country and its citizens. Jhala Nath khanal� was the member of of the�Communist Party of Nepal (Marxist-Leninist), and was its General Secretary from 1982 to 1986. Later, he was a member of the CPN (UML). Khanal served for atime as Minister of Information and Communication in the 1997 coalition government .� he was the 35th prime minister of Nepal. He has done many good things ih the behalf of welfare of the citizens of the country. He is oner of the good politician of Nepal as he was also a chairman of Communist Party of Nepal ( unifiedMarxist –leninist). He was primiminister since feburary 2011 to August 2011. He ha contributed a lot of good things for the citizen as being a politician. Ram Baran Yadav �is one of the politician as well as physician. He was the first president of Nepal he was president since�23 July 2008 to 29 October 2015. Previously he served as�minister�of�Health�from 1999 to 2001 and was General�Secretary�of the�Nepali Congress�party. He was Minister of State for Health in the 1991–1994 from� Nepali Congress government.�He was elected to the�House of Representatives�in the�election�as a candidate of the Nepali Congress. After that election, he became Minister of Health. He began his political career while studying medicine in�Calcutta, India. He came in contact with several�Nepali politicians�who had self-exiled themselves in India, such as�B.P. 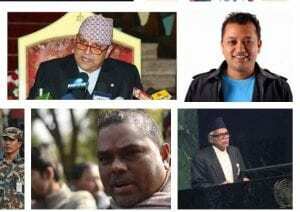 Koirala,�Ganesh Man Singh,�Subarna Shamsher Rana,�Pushpa Lal Shrestha, and Saroj Koirala. Inspired by these leaders, Yadav started engaging himself in politics actively. He championed the cause for multi-party democracy during the referendum held in 1980. He was known as hadrdworking leader among all, he was too good in his leading skills, due to which is is popular among all people. Nanda bahadur pun or we can say nanda kishor pun is the second and the current vice president of Nepal since 2015. He was a a member of the�Central Committee�of the�Communist Party of Nepal (Maoist-Centre). He became involved in radical student politics and became a district committee member of�Communist Party of Nepal (Unity Centre). In 1990 he became district president of the youth wing of the party. When the party was divided in 1994, Pun sided with the wing that would become the Communist Party of Nepal (Maoist). His youth organization was converted into a militia, that took part in the launching of�People’s War�in February 1996. After the PLA was formed in 2001 he became commander of the first PLA battalion. Eventually he would become one of four deputy commanders of the PLA. During the war he led PLA forces in several� battles. �Beating�Nepali Congress�candidate Amiya Kumar Yadav by 113 votes, he was elected as Nepal’s second Vice President in October 2015. Hisila yami�is a�Nepalese�politician and architect. She is a Central Committee member of�Communist Party of Nepal (Maoist-Centre)�and a former president of the�All Nepal Women’s Association (Revolutionary).Her father�Dharma Ratna Yami�was a Nepalese freedom fighter, author and government deputy minister. Yami graduated from the School of Planning and Architecture in�Delhi,�India, in 1982. She completed her M. Arch. from the University of Newcastle upon Tyne in U.K. in 1995. During the 1990 uprising against the panchayat regime, Yami was one of the most high-profile women leaders in the protests. She was also the General Secretary of All India Nepalese Students’ Association, 1981–1982. She was a lecturer at Institute of Engineering, Pulchowk Campus from 1983 to 1996. In 1995 she became the President of the All Nepal Women’s Association (Revolutionary) and served a two-year term. She went underground in 1996 after the inception of the Communist Party of Nepal (Maoist) led People’s War. Since 2001, she has been a Central Committee Member of CPN (Maoist) and has worked in departments such as the International Department of the organization.She made her first public appearance on June 18, 2003, during the then ongoing peace negotiations between the government and the Maoists.She is one of the example for Nepalese women that women also can be as interactive as men� and they can do any sorts of works that men can do. She is� one of the amazing leader� among many leaders.